Floyd Rose rose to fame thanks to his part in the iconic ’80s guitar rock sound. While the move to headphones doesn’t have the same success, there are flourishes here that certainly impress. Floyd Rose is little known in headphone circles but a name in the guitar world. He revolutionized the tremolo (ie, whammy) bar in the ’80s, creating a guitar system that would be adopted by axe gods that included Eddie Van Halen, Kirk Hammett and Tom Morello. Like many brands before it, such as Yamaha and Marshall, Floyd Rose has decided to stretch the brand to audio products and the Floyd Rose FR-18M wood headphones are part of this brand extension. It’s worth noting that these headphones have been available in some capacity in the US for some time now, but the UK can now get their audio fix too. Let’s get this out of the way first: wood on headphones isn’t to everybody’s tastes. When done wrong, it can look plain garish. Done right, though, it can give an air of refinement to a pair of cans that you just can’t get from plastic. Taking one look at the box that the headphones come in and you can see that Floyd Rose want to make an impact with its FR-18Ms. These headphones come in a chunky mahogany case, in which they are laid on soft fabric. It’s certainly a statement but an entirely impractical one. The case isn’t exactly something you would carry around with you, but we have to admire the pomp of it all. The wood look is on the headphones, too. Each cup has been made out of mahogany and then lacquered. The finish is lovely, with the FR logo central on both cups. The cups themselves have something of a teardrop (plectrum?) shape and are connected by a metal hinge that also is adorned by the Floyd Rose signature. The earcups were comfortable to wear, even in the blazing sunshine of summer, and we were surprised by just how light the headphones felt on the head. The teardrop shape meant they encased the ear nicely and were fine for listening to music for extended periods. On-board is also a tangle-free rope-cladded wire which comes not connected to the headphones. Be careful connecting this, as we initially put it on the wrong ear (left in the right slot) and it was really really difficult to get the wire back out, once it is slotted in. We managed it but did sweat a bit while doing it, fearing we would break the unit we had. On the cable are volume and call buttons - these controls work nicely with both Android and iOS devices. 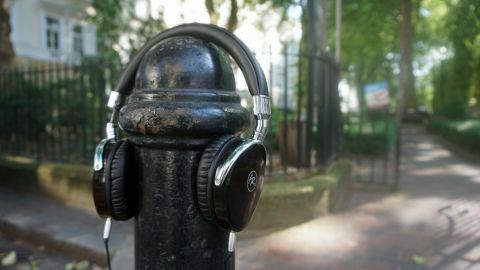 The headphones are rounded off with a retractable frame, which you can make bigger or small depending on the size of your head, and a gold-plated 3.5mm jack. On the head, the FR-18Ms are really comfy. The materials used - namely wood - give off the impression that there is a weight to these headphones, but they are light at around 200g. The soft leather on the cups really do envelop the ears – our only real gripe is with the grip. Even made as tight as possible the headphones don’t have quite the ‘squeeze’ on our head that we would have liked. It’s not like they are going to fall off, but a bit more pressure around the ears would have been appreciated and wouldn’t impede on the comfort either. To test the sound of the headphones we chose a number of tracks, from a number of genres. The FR-18Ms have the standard frequency response of 20-20,000Hz and ohms are measured at 32. This puts the headphones firmly in the ideal for ‘on the go’ listening bracket, so most of our listening was done while in situ. The first thing that hit with the sound was the warmth of it, which at times got a bit too muggy. Listening to Goldfrapp’s Ocean (featuring David Gahan) and the spaced-out beat became a little too distant and murky for our liking. There was definitely a intensity to the bass but it felt like it was fighting to come to the fore. The same happened when we put on Gritty Shaker by David Holmes. Where normally there is a clarity between the bass of the track and the treble of the beat, they seemed a little too mixed together for us. The softer the music, the better the FR-18s fared, which seems a little at odds with the makers’ rock’n’roll roots. Wildflowers by the fantastic Soccer Mommy sounded excellent with a crispness that was missing from our previous tests, the strum of each guitar string reverberating nicely around the earcups of the FR-18Ms and when the bass comes in, it’s there with intent. Miki Dora by Amon Dunes had a ‘smokey bar in the middle of the night’ feel to it, the bass threatening to take over the main vocals but sidelined by the FR-18s sound. Whether it’s the wood causing the warming sound, or merely how the headphones have been tuned to the lower end so bass makes way for clarity, it’s a sound that isn’t for everyone. The Floyd Rose FR-18Ms aren’t for everyone. In a world increasingly overrun by bluetooth cans and plastic looks, the FR-18Ms stand proud with their wooden look, wooden box and warmer sound. Like their sound, it’s not completely clear who these headphones are for - they seem to be pandering for the high-end crowd but with a price (and sound) that’s more modest. Their look, though, is as premium as you can get.